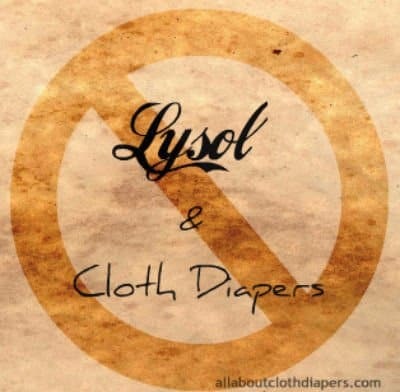 I’ve had enough people ask me about using Lysol to disinfect cloth diapers that it has me worried. When someone says the word ‘Lysol’, the aerosol spray can pops into me head. Maybe you picture the wipes or the spray cleaners. Either way, when you hear Lysol and disinfect cloth diapers used in the same sentence please think of me saying this in your head: No…just no. There is a Lysol product that is labeled for use as a laundry disinfectant; the Lysol Concentrate Disinfectant (brown bottle). (I’ll tell you why I won’t be using it on my cd’s in a second.) You have to use 8 oz of the 12 oz bottle per load to disinfect and a bottle runs about $6. That makes it an expensive choice. But there is more to it than cost. Worth noting are a few of the ingredients in Lysol Concentrate Disinfectant (1). o-Benzyl-p-chorophenol: In addition to being a disinfectant, it is also used as a pesticide (2). The pesticide part is what bothers me. potassium hydroxide: It is on the EPA’s Right to Know Hazardous Substances list; not reported in this quantity, but still it’s on the list (3 & 4). Also used to chemically assist the removal of hair from animal hides (5). *disclaimer* I’m not perfect. I use synthetic chemical filled fabric softener on my clothing because I love the smell. I drink soda (my 2.5 year old does not). You can probably find a horribly toxic toilet cleaner in my storage closet if you look hard enough. But…I try to cut out the bad stuff when I can. I think it’s a good thing if we all try to do this when our children are involved. This is one of those things that I can tell you to go ahead and cut out. I don’t think a rinse (or two) in my washer would remove every trace of the Lysol Disinfectant. 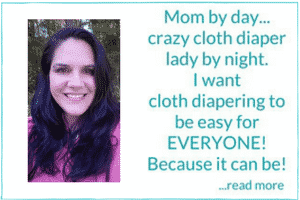 I’d prefer not to put a cloth diaper on my baby’s most sensitive areas after it has been soaked in it. Maybe it does all rinse out; but I say why take the chance when there ARE better options that work? For other disinfecting alternatives please check this out. (1) RB Products. Lysol, 2012. Web. 25 Feb. 2015. <http://www.rbnainfo.com/productpro/ProductSearch.do?brandId=19&productLineId=342&searchType=PL&template=1>. (2) “Ortho-Benzyl-P-Chlorophenol: Reregistration Eligibiity Decision (RED) Fact Sheet | US EPA ARCHIVE DOCUMENTOrtho-Benzyl-P-Chlorophenol: Reregistration Eligibiity Decision Fact Sheet.” (n.d.): n. pag. EPA Website. EPA, 1995. Web. 2015. <http://www.epa.gov/opp00001/reregistration/REDs/factsheets/2045fact.pdf>. (3) “Section D. Superfund and Community Right-to-Know Requirements.” EPA. Environmental Protection Agency, 1 Dec. 2008. Web. 25 Feb. 2015. <http://www.epa.gov/dfe/pubs/pwb/tech_rep/fedregs/regsectd.htm>. (4) US. NJ Dept of Health. Right to Know Hazardous Substance Fact Sheet. N.p. : n.p., n.d. Web. 25 Feb. 2015. <http://nj.gov/health/eoh/rtkweb/documents/fs/1571.pdf>. (5) “Potassium Hydroxide.” Wikipedia. Wikimedia Foundation, 12 Feb. 2015. Web. 25 Feb. 2015. <http://en.wikipedia.org/wiki/Potassium_hydroxide>. What about the Lysol laundry sanitizer in the blue bottle.? I understand it is a newer item, but hasn’t really been addressed in the cloth world except by the 3 letter cult I’d rather not get advice from. (They said to use 1.5 liters per 1/2 bathtub of water!) I’ve used it following the sanitize directions. Cap amount called for and a 16minutes soak before rinse. I didn’t notice any issues but it smells heavily scented. You folks can take a perfectly informative conversation, and turn it into an insult party. Keep the POSITIVE comments coming. I was learning so much, and then, the whole thing ended up in the ditch. C’mon people, Love is the answer. Be kind…. How stupid can you be. You don’t use 8 oz of a concentrate. One 12 oz bottle makes 9, I repeat, 9 GALLONS of disinfectant. The 8oz you put into your laundry is equal to washing your cloths in over TWO GALLONS of disinfectant. People like you should learn to read and do elementary school math. You’re as dumb as a rock. No I take that back. Rocks have college degrees compaired to you. So in order to disinfect a full load of laundry, you would need…well since I’m so stupid I’ll let you do the math. Couple things. One: your first sentence is a question, thus,needing a question mark instead of a period. Two: it is compared not compaired. I suggest utilizing spell check. Also, look up the definition of a run on sentence as well as comma placement. My child is fully vaccinated. Thanks for checking though. “No, just No” is exactly what I said after picking up my son from the in-laws. I picked up his wet bag and noticed a strong smell. I asked, “Did you put dish detergent in here?” MIL, “No, Lysol.” I suggested she hang the bag outside if the smell was unpleasant. I had to wash those diapers, so. many. times. 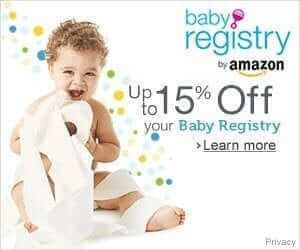 I would never even think about putting that anywhere near my baby. Who would want that yuck on their babies bum!! Is Soil Love good for removing cloth diaper stains? Everyone at work uses it on their white work pants and my friend told me that it works so well, she had to water it because it stained her pants “too white”. Also, I can get it for a buck at the 99 cents store. Is it safe (to kids and cloth diapers)?